`Antariksham` - A Daring Attempt. Mihira (Indian satellite) becomes dysfunctional and the Authorities fear this may end up destroying the entire communication system of the world. Dev (Varun Tej), a Noted Space Scientist & Astronaut is brought back to solve this disastrous glitch. He along with his fellow astronauts embark on an adventurous journey. 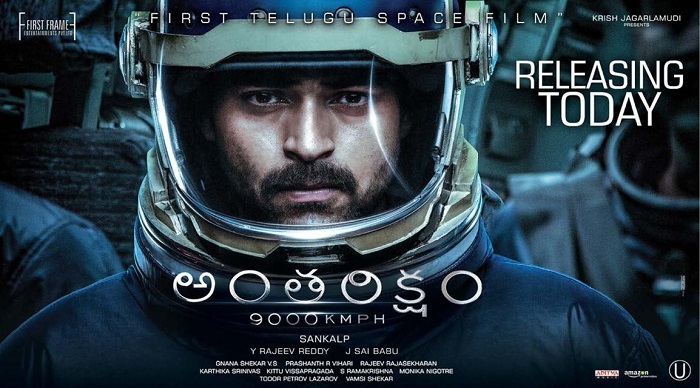 Varun Tej is good and convincing both as Dejected and Adventurous Astronaut. Aditi Rao makes a good impact and Lavanya is adequate. Satya Dev, Rahman, Raja Chebrolu, Srinivas Avasarala and etc.,. make for a good supporting cast. `Antariksham` as it is already evident from the Promotional Content, is solely based on Space Exploratory Travels. The 1st half of the film tracks the majority of the story and conflict angle, setting us up for a full fledged Space Thriller 2nd half. It is a Daring attempt which probably didn`t leave the desired impact since majority audience may not be able to grasp what actually is transpiring many a times. The film is to be seen for its Visual appeal and Tense Drama over Space aided by decent Music. Cheers to the Whole Team for their Novel attempt. With Worldwide Theatricals Value at 21 Cr, this may not make much impact except in USA & Nizam.